Textaizer Pro creates text art in all its creative shapes. It also includes extensive possibilities to create genuine ASCII art. And much more. A text mosaic is a picture which is built from hundreds or thousands of characters. Each character takes the colour of the area that is replaced by this character, and when looking from a distance the original source picture is recognised. If looking close-up, the individual characters can be seen. Textaizer Pro has 6 different text art engines with interesting names like 'Crazy Characters' and 'Word Art'. Below you will find examples of each of the engines. Here you find a review of Textaizer Pro. Textaizer is a stand-alone application that works under windows or under a windows environment in OS-X (mac). After installation you can immediately create your own text art. In the first period of use the application is unrestricted and fully functional. When these grace days have expired a few professional features will be limited or locked. We believe it's just great to make something extra-ordinary out of the ordinary. You can turn any picture into a little piece of art by re-painting it with your selection of words. Choose your text or a file with many words, select your source picture and press the 'Create' button. Make a secret message, or draw and print balloons with 100's of 'Happy Birthday' words. The result from Textaizer Pro can be saved on harddisk and printed. Really huge prints with impressive resolution can be created. Print, or post-process, mail or publish the text mosaic. You have full control over the end result. And you can also save as .pdf and .emf for almost limitless resizing and printing. The only limitation is the size of your printer! There are many text art creators available on the web. Some of them are great doing one thing, but does not do the other. Textaizer Pro does it all, and it offers great extra possibilities and customizations. And has unique features, like 'Crazy Characters' and the possibility to create text mosaic movies with dancing characters. All that makes Textaizer Pro truly unique. We take pride in an impeccable client response. Any user is a client, not depending in any way if the user has purchased a license or not. Of course paying customers are platinum, but all other users are considered gold. Found a bug? Report it to us. Don't understand how it works? Drop us a mail and we'll explain it. Want a new feature? Suggest it to us. We are there for you. The software is free to use, is fully functional during the grace period, after which some restrictions will apply. It's freeware, while some advanced features are only available for paying users after the grace period has expired. The current version has Unicode support. Please be aware that Windows XP and older does not support Unicode, and in case you offer non-latin characters (e.g. Chinese or Hindi) the application may fail to create a proper word art. 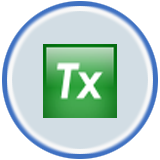 Download Textaizer Pro (Security report: 100% clean, by Softpedia). Not downloading? Refresh your browser, because our website is secured, starting with 'https://' !! Example of Text Mosaic: The picture of Tin Tin was recreated with a black background and a circular text. Each word is rotated around a hand-picked point in the source picture. The result is quite effective. Example of ASCII Art: Superman in only ASCII characters. To be precisely: 67,295 characters, filesize on disk 4375 x 6293 pixels. Example of Word Art: Lene Marlin was recreated using only Beatles song titles. On the right you see the eyes in real size. Example of Crazy Characters: Caro Emerald made with only characters, each having a simple shadow to make a 3D effect. This can be made by using the mouse and 'write' characters, or let the application do this for you. Fully automated with loads of tweaking parameters to make it look special. Example of ASCII Draw: Perhaps not the coolest part of Textaizer Pro but surely usable. Draw a kind of ASCII outline of every possible shape. You can use a picture to guide you draw the thick line, and then let the application determine where to put the basic characters. A kind of simple home-made ASCII art. The result is output as text file or as HTML. Example of Text Art: Draw a word at almost every size, with the character font different from the overall word font. Use a special character for each character in the word, or use it's own character. Confusing perhaps, but worth trying. Example of ASCII Art with retro characters: unlike the Superman example we have used the block characters from the good old matrix printing days. The result is very accurate: the picture on the left is not the original, but the resized version of the actual output. And great looking as well. Can also be output in HTML for use at web-pages. Example of Text Mosaic in UNICODE words: Bjork has been redrawn in Icelandic words. We used the 'density mask' feature to highlight the hands and face, while the rest of the source picture is using smaller font sizes. All these examples were made with the default installed files and pictures. Some examples were made after a few font, size, text and source picture input edits. All the text and fonts that were used here are available after installation, including the Unicode example.